Great Food and Drink Prints for Any Kitchen Sewing Pattern or Project! As I explored microwave bowl potholders and then started designing the pie plate potholder, I was searching for the perfect fabric. There are SO many wonderful food and drink prints available, that my imagination began seeing snack dishes, special aprons as gifts for friends as well as the shaped potholders... yes I'm living the life of a fabric hoarder. Note - Many of these sites have similar fabric and many have a completely unique selection. Shop around to see who is offering you the best price and who has the quantity on hand that you need for your project. A nice assortment of food prints for potholder dishes, aprons, curtains and ,ore. I'm picturing the tortilla chip and hot sauce fabrics making great football game snack dishes. Be sure to browse their site if you are looking for a specific fabric. I discovered a wonderful "Italian Foods Fabric" was not included in the food collection of fabric. This HUGE selection of kitchen and food prints is bound to have an appropriate fabric for any free kitchen sewing project that you can think of. This site has a HUGE selection of prints and coordinating fabric. This site does cater to quilters and offers sets of 10" squares as well as yardage.10" squares may work very well for you if you are making microwave bowl potholders. This site offers a huge selection of food and kitchen theme print fabrics. I found one that would be perfect for my next mixer cover and so many that the gears are working over time thinking of ways to use all those fabrics. I don't know enough people for all of the fabrics that would make a great binder cover to collect recipes with out doing embroidery. Shrimp, bacon, pasta, martinis, chocolate, cheeses, pies,beer, popcorn and MANY more make this a terrific selection of food prints for any type of project. Chef Panel - a great pasta print of "plump" chefs. 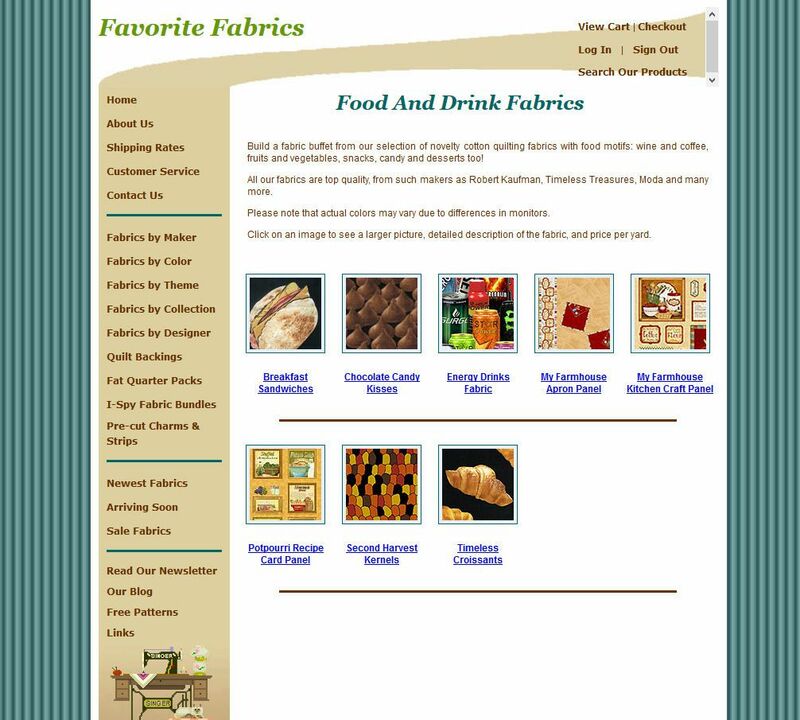 This site offers a unique selection of food and kitchen fabrics for almost any project you can think of. I know some of my friends would LOVE the "Super Food" prints in an apron or some type of pot holder! You'll also find purchasable patterns for kitchen items sprinkled in with the kitchen fabrics. This site offers an amazing selection of 127 different prints... they even have blender prints that would be great for a blender cover. Their vast assortment increases the odds of you finding the fabric you have in mind... even a broccoli print! There are SO many wonderful food and drink themed fabrics to choose from you may need to add to your list of projects you want to make. As always free patterns are the best way to keep your expenses under control!